I Have Not Owned It For All Of Its 125 Years! On May 24, 1883, thousands of people crowded lower Manhattan and Brooklyn for the grandest of all ceremonies from all over the area—even as far away as Philadelphia. Dignitaries gathered at the armory of the Seventh Regiment on Park Avenue to board carriages to join a colour guard, a 70-piece band, and a 22-piece drum corp for the festivities. Forty mounted police officers accompanied the parade. The list of dignitaries was a Who’s Who of the political America that included President Chester A. Arthur, New York Governor Grover Cleveland, and New York City Mayor Franklin Edson. The carriage carrying President Arthur and Mayor Edson lead the parade surrounded by a very large cheering crowd. At 1:50 PM, the processional arrived at the entrance of the new bridge, President Arthur and Mayor Edson left their carriage and crossed what was the world’s longest suspension bridge arm-in-arm to a cheering crowd who paid $2 for tickets to watch from the bridge. The band played Hail to the Chief as ships who came to the ceremony and anchored around the East River blew horns to honor the President. Navy ships who were invited to the ceremonies took turns giving 21-gun salutes. Present Arthur and Mayor Edson were joined by Brooklyn Mayor Seth Low when they arrived on the other side of the new bridge. The three men locked arms and marched to the Brooklyn Pier to complete the ceremony dedicating the Brooklyn Bridge to the people of the New York City and Brooklyn. Kickoff for the Brooklyn Bridge 125th Anniversary Celebration began on May 22 with a concert by the Brooklyn Philharmonic and fireworks by the Gruccis, the first family of fireworks. The celebration extends through Monday that includes a walking tour of this impressive structure on Saturday, the anniversary. 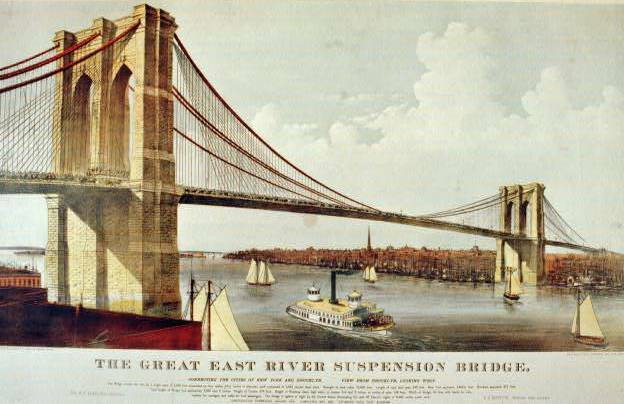 In honor of the 125th Birthday of the bridge everyone owns, the image to the right is a bronze medal commemorating her Centennial (click to enlarge). This medal was produced by the Medallic Arts Company for Brooklyn Union Gas. Silver medals were made for the company’s executives. Bronze medals were given to some employees and offered for sale to the public. When the company that owns Brooklyn Union Gas merged with the Long Island Lighting Company (LILCo) in 1998, the company changed its name to KeySpan Energy. In 2007, KeySpan was bought by National Grid plc of London. By the way… I have a bridge I can sell to you. Let me know and I can give you a good deal! Source: “Two Great Cities United,” [PDF] The New York Times, May 25, 1883.